Last weekend I made a trip home to Michigan to celebrate my baby shower with my family and friends. It was a great weekend and I had such a wonderful time with everyone, but getting there and back was a little bit draining. I didn't want to miss any work days, so I was forced to take a red eye on Friday night from Las Vegas and then fly out late on Sunday night from Detroit. Even though I was extremely excited about all the festivities for the weekend, I was also worried that my pregnant self would be completely exhausted. This is why I started to prepare for my trip before I left. I knew that if I was going to get any rest on the plane I would have to be dressed comfortable. When I say dress comfortable, I don't mean sweat pants and hoodies (that look is perfect for my couch, but not for public). I always like to find ways to be cute and stylish while traveling all while staying comfortable and cozy. That's what I did for this trip. Here are my comfortable travel looks from the weekend. 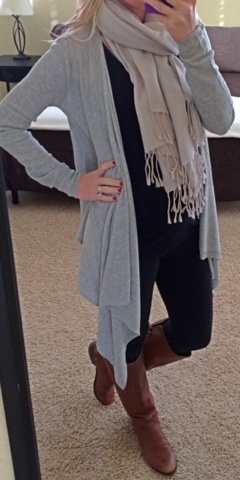 Leggings are a must for me when it comes dressing comfortable, especially while pregnant. 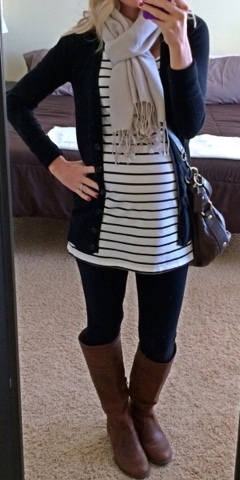 On my way to Michigan, I wore leggings with a long striped tunic tank top (exact here), a black boyfriend cardigan sweater (exact here) and brown boots. (I actually wore the boots below, because I only packed one pair.) I also brought along my favorite purse for traveling, my brown leather crossbody Coach purse. I always feel like it's important to have a decent size purse while traveling to fit all those extra items you may need while traveling. I also like to have a crossbody purse for the airport, because it's always nice to have your arms free while traveling. For my flight back to Vegas, I wore another cozy look with leggings and boots. I wore black leggings, a black tank top, a waterfall cardigan (exact here) and the same scarf I wore on the flight there. Scarves are another important item for me when traveling. I always like to wear layers and scarves are a perfect way to layer your look, especially when traveling through different climates. I'll be making another trip back to Michigan for Christmas, so looks like these will be the way I'll be traveling. How do you dress for comfort while traveling?